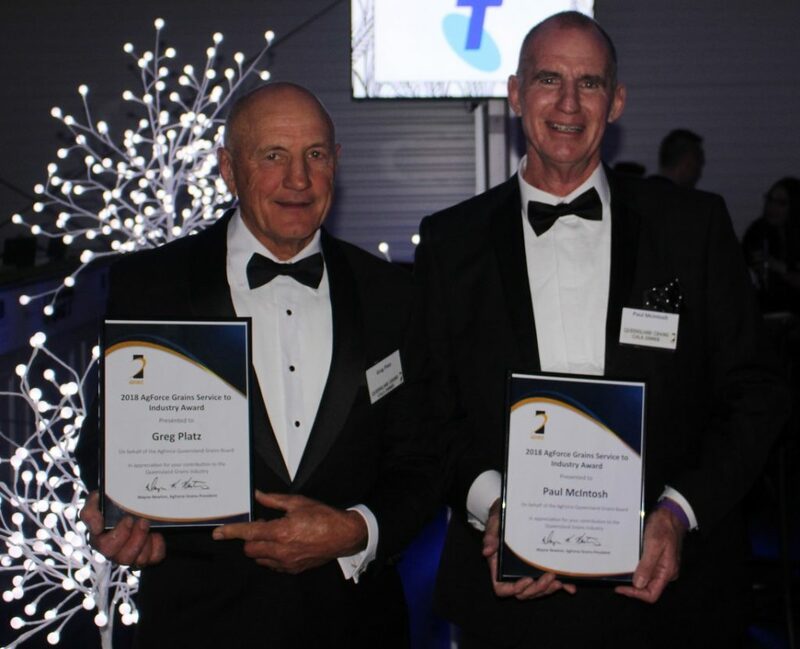 TWO grain industry titans, agronomist Paul McIntosh and plant pathologist Greg Platz, have received the ‘Service to Grains Industry’ award at this year’s AgForce Queensland Grains Gala Dinner in Toowoomba. AgForce Grains president Wayne Newton said AgForce decided to present two ‘Service to Grains Industry’ awards this year as it was impossible to limit the field of worthy recipients to just one. “There are so many worthy people making outstanding contributions to our industry and they often aren’t recognised, so the Queensland Grains Gala Dinner ‘Service to industry Award’ is a great opportunity to publicly acknowledge them every year,” he said. 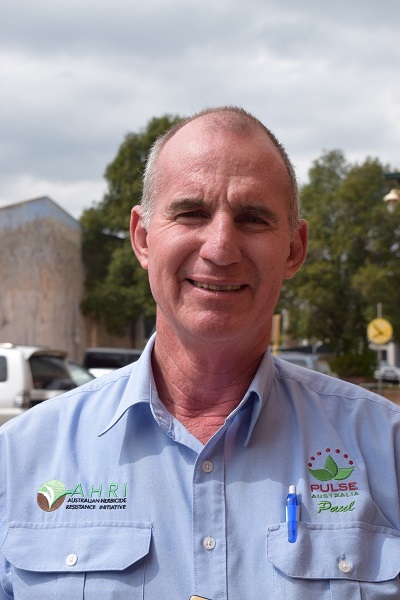 Paul McIntosh, who is currently industry development agronomist at Pulse Australia and northern weeds and crops extension agronomist with the Australian Herbicide Resistance Initiative (AHRI), has been devoted to agriculture all his working life. Growing up on a farm at Goomeri in Queensland’s South Burnett, he attended boarding school at TSS (The Southport School) before starting work with the Australian Estates Company as a trainee. He had a number of postings, including Goomeri, Charters Towers, Townsville, Julia Creek, Theodore, Rockhampton, Glen Innes, then took two years out playing high level cricket in Brisbane before returning to agriculture in the agronomy field. In what developed into a distinguished career as an agronomist, he has become well known throughout Australia for his agronomic knowledge and ability to relate to growers, agronomists and industry. Now based in Toowoomba, Mr McIntosh said the biggest change he had seen in farming over the years had been the adoption of zero till. However, while zero till had brought tremendous benefits to farming, the system’s reliance on herbicides also brought the challenge of developing ways to stave off the threat of weeds developing herbicide resistance. “If we don’t get on top of weeds by other means besides herbicides we will have a lot of trouble. So, we need to think of diversifying weed control away from just herbicides,” he said. Through his involvement with Pulse Australia, Mr McIntosh has also been instrumental in encouraging the adoption of pulse crops in Australian farming rotations. “With pulses, it is just about getting more people educated about using pulse crops and the important position they have in their cropping sequence,” he said. “It has been fantastic how people are taking up pulses like chickpeas and mungbeans. Queensland Department of Agriculture and Fisheries senior principal plant pathologist, Greg Platz, has just clocked up 50 years of service with the department. AgForce Queensland Grains president, Wayne Newton, and QDPI senior principal plant pathologist, Greg Platz. 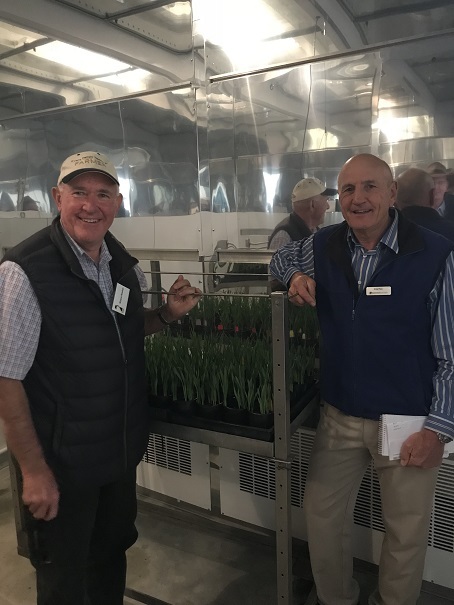 The sixth of seven children born to a farming family on Queensland’s Darling Downs between Nobby and Clifton, Mr Platz began work in the department under plant pathologist, Bob Rees, at the Queensland Wheat Research Institute in Toowoomba. “I was lucky enough to be a technician with Bob Rees for the greater part of my working life. We worked together for nearly 30 years. He was a mentor and taught me most of what I know about the game,” he said. When Mr Rees retired he recommended the portfolio be broken into separate, dedicated barley, oat and wheat components instead of one person trying to cover all three. Mr Platz was appointed to the oat breeding position in Toowoomba in the mid-1990s, then soon after transferred to the barley pathology position which required relocating to the Hermitage Research Facility at Warwick where he has been based for nearly 21 years. “The barley community nationally, and internationally, has been very good to me. We haven’t solved all the disease problems, but we continue to work on them. I strongly believe they are solvable, we just have to make a very concerted effort,” he said. Mr Platz said he had been in the department long enough to see Australian farming systems transition from burning stubble to stubble retention, which, despite its advantages, increased the incidence of fungal disease in crops and “has kept me employed ever since”. His work has mainly focused on the net blotches, but has also included work on yellow spot in wheat and the same types of diseases in barley. “Stubble retention was ushered in as a great idea in Australia, which it is, but the focus was on the soil and moisture benefits and never gave any attention to disease issues,” he said. Mr Platz said another significant change in farming practices had been the increased use of fungicides in growing cereals. “That is a big change to 20 years ago. That again brings its own issues with fungicide resistance,” he said. And another substantive shift had been the expansion of the private agronomy community. “I have found them excellent to work with, particularly the younger people who are out there pushing the limits. They want to make sure there are no diseases. They want to get every last bit out of a crop,” he said.